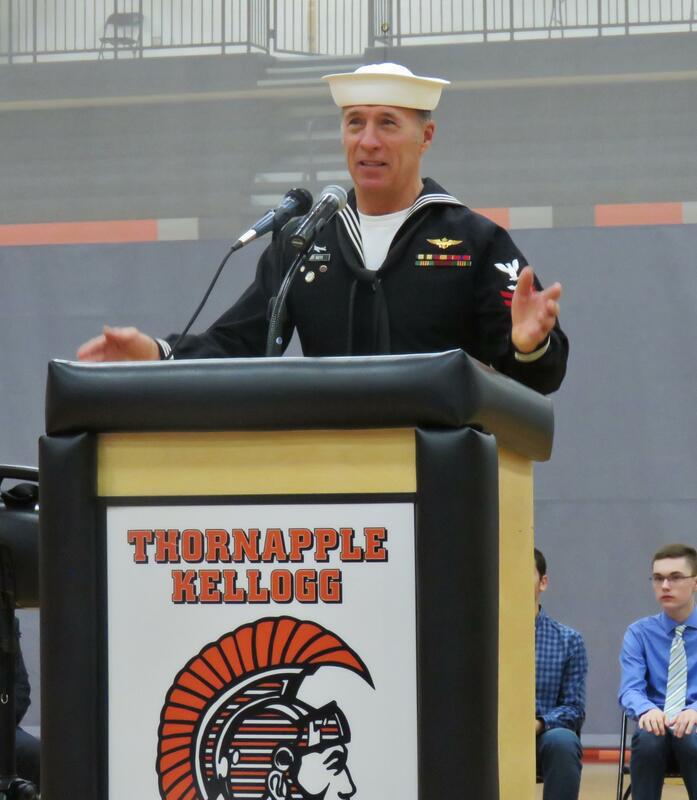 Bob Buys, a U.S. Navy veteran, said he was "humbled and honored" to be named the Middleville Veteran of the Year and he thanked the Middleville and Thornapple Kellogg School community for honoring veterans. 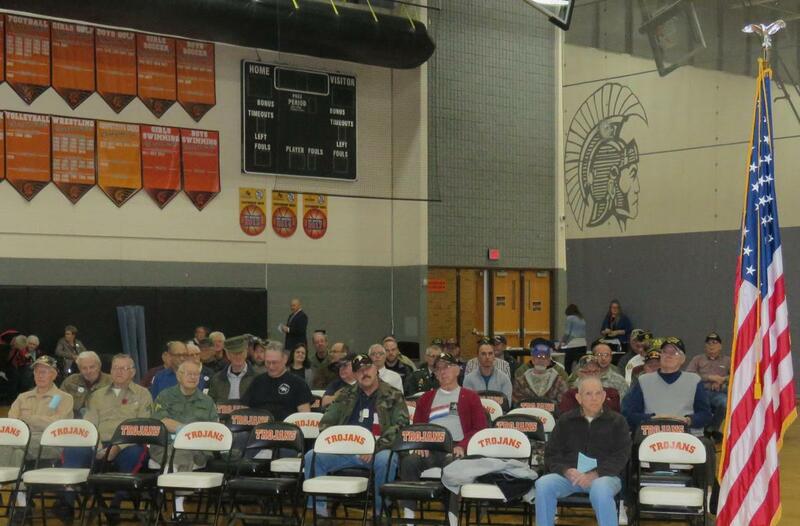 "I'm proud to be a veteran and I'm proud of the Middleville and TK community for being patriotic and paying respect. This community just gets it," he said. Buys was the guest of honor speaker at the annual TKHS School and Community Veterans Day program Monday. He joined the Middleville Memorial Day Parade committee a few years ago and has helped organize and run the annual event. He serves with the Color Guard and Rifle Team and has visited McFall to demonstrate to young students the 13 folds of the American flag. "I am not a hero," he said wearing his Navy uniform as a way of honoring all veterans. "I didn't serve in combat. I served during Vietnam, but I was not in Vietnam. These people sitting over here are heroes - not me." 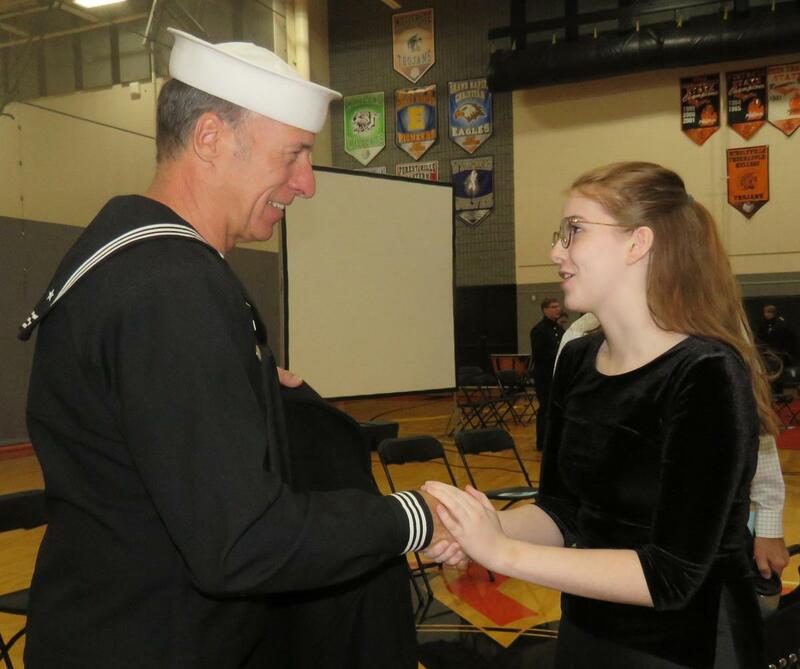 He told students his heroes personally were his grandfather who served in World War I, his great-uncle serving in World War II, and his father serving in Korea. Buys said his grandfather ran away from home and lied about his age to join the Army. His great-uncle enlisted in 1939 and was a pilot. His plane was shot down and he became a prisoner of war, forced to walk in the Bataan Death March without food or water, and then imprisoned in one of the worst prisoners of war camps. He died in 1942 after more than five months captivity, but to date, his remains have never been recovered. "I look at the little white table set here in front of me, (the MIA-POW table) and I think of my great-uncle. I think about all of those who didn't come back at all," he said. Buys said he was contacted last year by the military and notified of remains found in a mass grave near the camp. He provided a DNA sample in hopes of identifying remains of his great-uncle. "My hope is that I can give him a proper military burial," said Buys who served in the U.S. Navy from 1970 to 1974 as an aviation technician. The annual TKHS and community Veterans Day program gave students and community members a chance to show their appreciation for the service of veterans. This year, the names of 49 veterans attending the ceremony were read along with their branch of service. TK Honors Choir members performed tow patriotic pieces "My America," and "We Honor You." The TKHS symphonic band performed "The National Anthem," "Armed Forces on Parade," and "Hosts of Freedom." Several students from the AP History classes offered readings and brief comments. Caedon Zube welcomed guests, Payton Stewart offered a reading about the MIA-POW table, and Emma Fabiano read a piece simply called "Thank You." 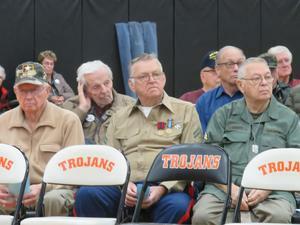 Howie Frizzell, another TKHS student, told classmates about what Veterans Day means to him. "It's a time to realize the totality of the bravery, selflessness and sacrifice these men and women have made for us," he said. Frizzell said his great-grandfather was in World War II. "He was there during Pearl Harbor and the Battle of the Midway," said Frizzell. Frizzell's grandfather was drafted in the 1960s in Vietnam. "He is what Veterans Day means to me. He knew his duty and that it had to be done, even if it wasn't his choice." High school teacher Lance Laker gave an inspiring history lesson about "The Star Spangled Banner" written by Francis Scott Key after witnessing the bombardment of Fort McHenry by the British in September 1814. While everyone knows the words to the song that became our country’s anthem in 1931, Laker asked that everyone really think about the words as he read them. He told guests what many don’t know are the remaining three verses of the Star Spangled Banner and the last line of the last verse answers that very question.